What changes when our screens and networks know us, learn from us and respond to us? Like GPS, our best paths to success will be learned and turned into Active Knowledge that can be delivered to everyone. When Active Knowledge and the sharing economy work together, everyone will have access to humanity’s combined abilities, tools and resources. Tech’s products, services and digital content could serve everyone who wants to rise and become the best. At six in the morning women in clean blouses and men in well-patched overalls walk down a narrow packed lane, backs straight and heads upright. They drop banana skins and wrappers from quick-fry breakfasts, crushing them to dust under thousands of mostly unshod feet. Everyone flows in the same direction, toward the fast-growing city of Nairobi and its jobs. Kamau Kgosi’s eyes were alert, focused on the hand-held screen as he walked. Unlike the others he had just arrived on an overnight minibus from his dusty village, all his worldly possessions in a small faded sack. His cousin had left three years earlier, impoverished. When he returned for a visit he showed off clean clothes, two mobile phones and the latest tablet. Kamau returned with him, and now he walked toward the city with the morning’s crowd, looking for work on the mobile phone he had borrowed from his cousin. Without his knowing it, his cousin had opted-in to Active Knowledge. This free network service offered the best known information and choices to everyone as they use devices. That made most of search obsolete, while giving everyone the world’s best know-how and choices. Though Kamau didn’t know it, Active Knowledge had used large numbers of similar responses to identify the most successful task paths. Then, like GPS, it delivered those steps as optional choices to the individual users who wanted them. In a few seconds Kamau’s current device looked the same, but it connected virtually to the expensive shared tablet that was running a “find work” app that displayed immediately available day jobs. A popup said “You can run this by remote control if you trade the use of your device and its public content and apps. Do you agree?” Kamau agreed. Little did he know it, but Kamau had just added his device to countless other shared devices worldwide. Together, growing pools of processing power, apps and content were accessible worldwide as users accessed others’ devices and shared theirs in return. Sharing transformed tech’s worldwide capabilities into an open resource where individual users no longer need to buy every piece. With new payment systems, even the original vendors of the products, services and content can be paid. Rather than turning off older high-powered systems, countless numbers were left running as fully loaded shared devices, because they built their owners’ sharing accounts. High-bandwidth devices selectively delivered their software and apps, online services, subscriptions and digital entertainment books and movies. Many of those owners earned enough “sharing credits” to use the world’s vast tech capabilities as an “always on” personal resource from all their screens. Kamau was pleased as the popups continued, guiding him in finding and confirming his first day job. In case he wanted to achieve faster and better, it offered options for how to dress to impress a new employer, and where to buy those clothes and shoes on his way to that job. Kamau didn’t know it, but these purchases helped pay for Active Knowledge. In the same way that Google’s Search is really an advertising network, Active Knowledge was an invisible, embedded marketing channel that fit every user’s immediate needs, every minute of the day. Active Knowledge made a lot of advertising, shopping and online stores obsolete. Whether Macy’s, Amazon or Google Shopping, Active Knowledge made them all obsolete by delivering what everyone needed personally and privately — during the task when it was needed immediately. Because Expandiverse sharing was an affordable option, its “shared digital economy” was a popular choice. For most people, digital sharing produced higher living standards with more personal satisfaction than buying and owning. Within minutes Kamau was walking with his head held high, guided straight to his first employer by GPS from the remote controlled shared device. He was guided by stores where he could buy or share better clothes, and he paused to look. That would come soon, he thought, as he started making money and would need better clothes, devices and ways to succeed. As he walked, Kamau listened to a few tips about how to make this a good first day with a new employer. Kamau smiled as he exited Kibera, one of Africa’s largest slums, and entered Nairobi for his first day of work on a Digital Earth. 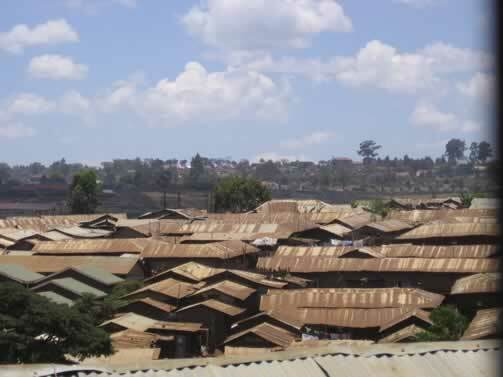 Image credit: Kibera rooftops, in Nairobi, by khym54. Share the post "Aware and sharing networks help everyone start from the bottom, and rise"